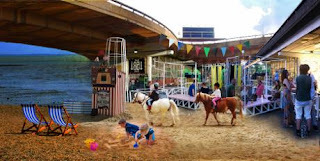 For one weekend - Fri 26th - Sun 28th June 2015 - Acklam Village (under the Westway flyover where it meets the Portobello Road) will turn into a beach, with all the fun of the seaside, inc sandcastles, beach huts, deckchairs, and a beach market. "This year the National Trust celebrates 50 years since the launch of the Neptune Coastline Campaign. Thanks to the support of many thousands of people, Neptune has helped to fund the acquisition of 574 miles of coastline. The National Trust now cares for 775 miles of the coastline of England, Wales and Northern Ireland – including the White Cliffs of Dover and the Giant’s Causeway in Northern Ireland. Millions of people visit these special places every year. Along the UK’s coastline are fun-filled events, wildlife and cultural heritage. Now you can experience the beach right here in London and enjoy the National Trust’s coastal celebrations amidst the concrete jungle of our capital. Under the imposing landmarks of the Westway flyover, Trellick Tower and alongside the Portobello Road, the Westway Beach, at Acklam Village will become a visual spectacle with all the fun of the seaside. Think sunbathing, sandcastles, wind breakers, beach huts, deckchairs, carousels, dunes, cut-out scene photo ops, bunting, windmills, end-of-the pier attractions and cabaret."